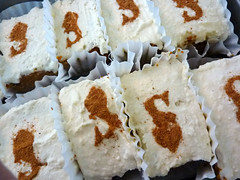 Big Fish Games logo on Pumpkin cake! My workmate David and I had the most amazing pie at Macrina Bakery yesterday at lunch. I believe all the baking apples are in season right now, so it was just the perfect September dessert! 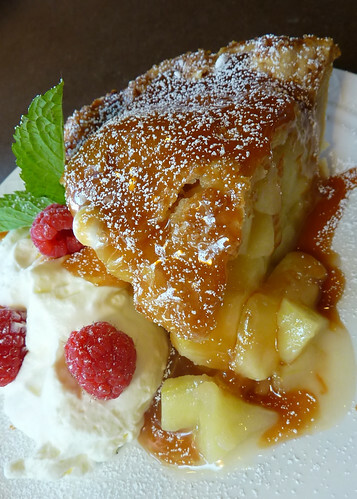 They put their own homemade caramel on the top, which gave the crust a wonderful crispness to it, but inside was the classic tart-sweet combo of apples, sugar, cinnamon, and whatever other secret ingredient they might put in there. I must say, Macrina does their crust really well. I could just have a plate of crusts. I'm back from Burning Man and finally decompressed, not to mention relatively dust free! I'll be sure to post some new "fork travels" soon! 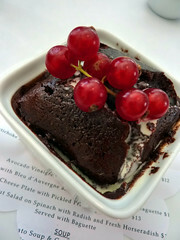 Here's a delectable dessert from the Boat Street Kitchen that my friend David ordered last week. Mmm Raspberry Chocolate soufflé! Those are little red grapes on top, which was interesting because they weren't in the actual dessert. It was really scrumptious from what I could tell...I had the smallest bite, because all 4 of us were sharing. *tsk tsk.